Each image has only 1 original and as such commands a much higher price tag than limited edition prints that I make from this. My originals are large statement pieces, often 1m wide or larger. Landscapes on this scale give the feeling they could almost be stepped into. Work is also available as limited edition fine art paper prints and fine art canvas prints. I also have a small greeting card range. ‘Windgather Rocks’ (87x104cm) Charcoal, acrylic and coloured pastel on paper. 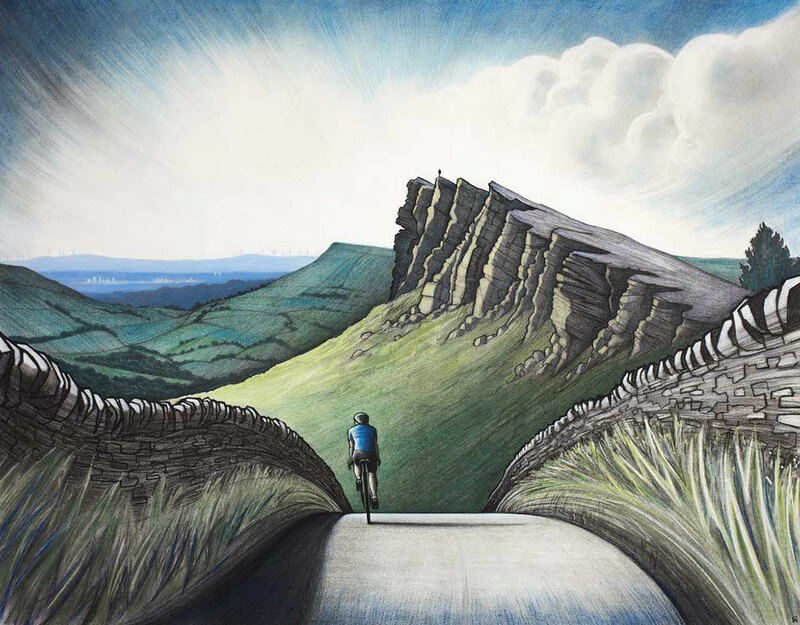 This drawing features the gritstone crags known as Windgather Rocks, which lie above Taxal Edge on the Derbyshire Cheshire border in the Peak District National Park. A lone rock climber has reached the summit and is looking over the valley towards the wind turbines in the distance. A cyclist approaching the brow of the hill is about to freewheel down the other side. In this piece I wanted to capture the feeling of freedom we get from being out in open country. Whether it is whooshing down a road on a bike, or seeing the landscape open up in front of you from at the summit of a hill. ‘We Salute You’ ( 90 x 75cm) Charcoal, acrylic and oil on canvas. 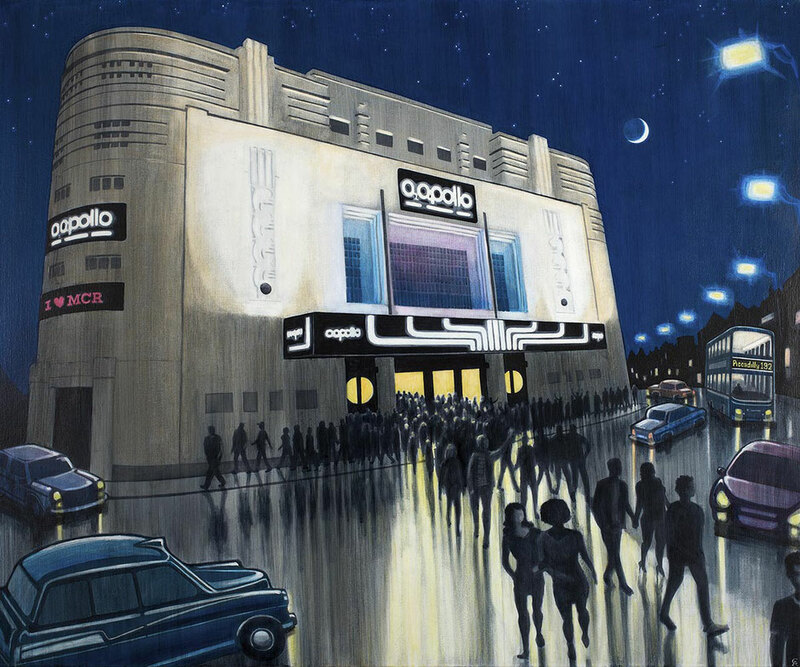 This painting features The Apollo, an art deco live music venue in Ardwick Green, Manchester. The music has finished and people are spilling out of the doors into the night. In this piece I have tried to capture the after- gig glow and camaraderie that follows a really good concert. The title refers to the ACDC song ‘For those about to rock... we salute you’, and references my first gig at the Apollo when I was 18 and saw ACDC live. The digital sign on the side of the building, ‘I Love Manchester’ refers to the campaign following the MEN Arena Ariana Grande concert bombing of 2017. This is a picture which describes the joy of live music, and the importance of keeping it going. A familiar sight at Carnivals and events across Derbyshire and the North West, the Billerettes are a (nearly) all male majorette dancing troupe. Named after their founder Bill Weston, they perform in short skirts and wigs, raising money for charity. 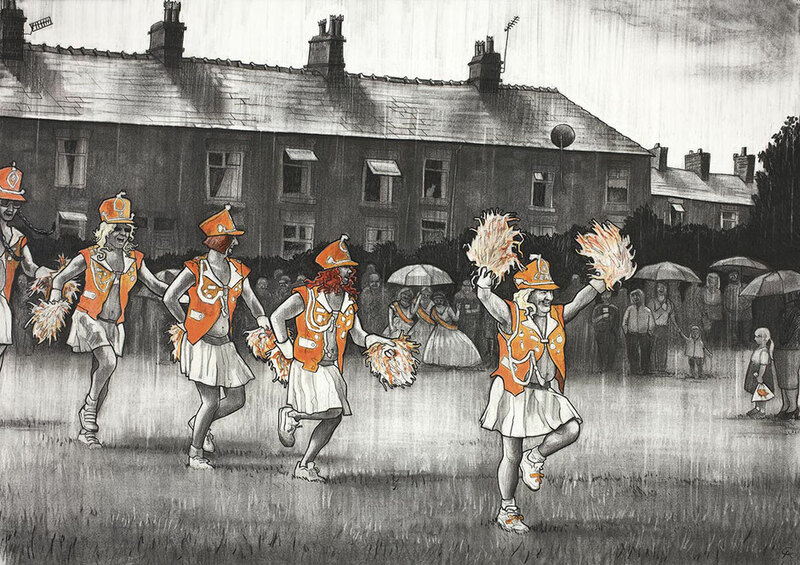 Here they perform in the rain on the carnival field by Torr Vale Road, New Mills, Derbyshire. I have used mainly charcoal in this piece, and the resulting drawing is predominantly black and white. The only colour is the bright orange of the dancers’ uniform, and a single gold fish in a plastic bag, (a little girl’s Fairground prize.) This is a celebration of a very Northern type of silliness which brings entertainment regardless of the Northern weather. 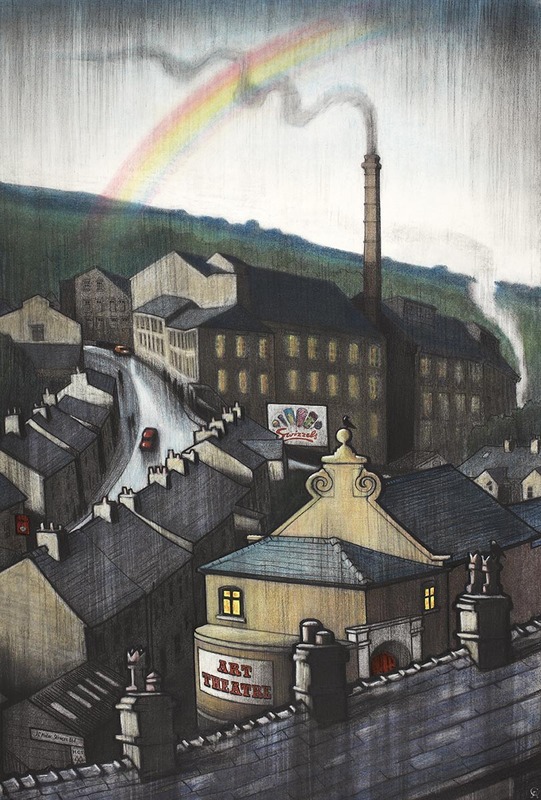 The main focus of this drawing is The Art Theatre, Jodrell Street, New Mills, Derbyshire. 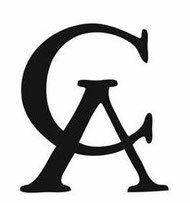 Hosting theatre, film, pantomine and dance, this community resource has enriched the cultural life of the working mill town since 1911. In the background Swizzels Matlow, the sweet factory (makers of the legendary Love hearts) can be seen. The title comes for the song ‘Singin’ in the rain’, and I imagined the people inside the Art Theatre singing away despite the weather. I drew this piece shortly after the Brexit vote , and it aims to express optimism in dark times. It may be raining, but there is a rainbow and we are still singing. ‘Albert Square (after Valette)’ (75 x 96cm) Charcoal on paper. 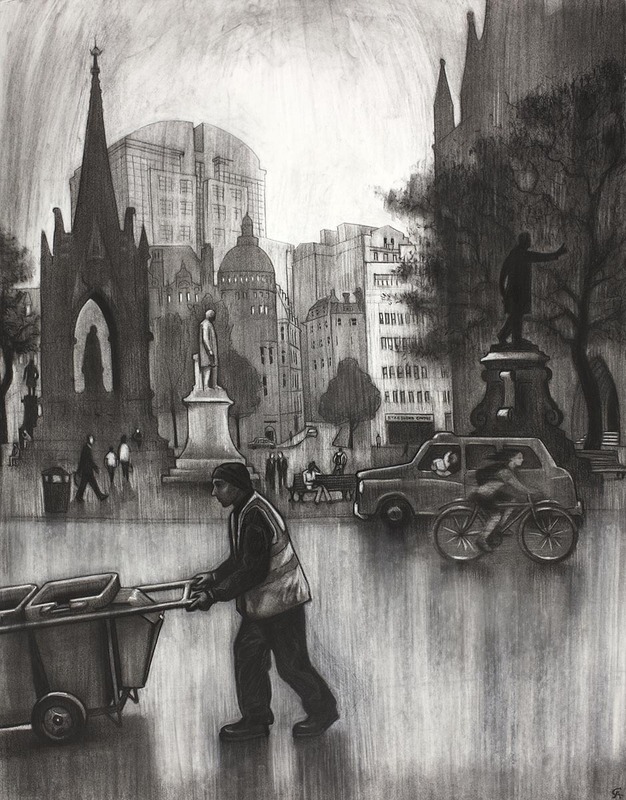 This charcoal drawing is a based on the 1910 painting, ‘Albert Square’ by the French artist Adophe Valette. A contemporary of Lowry, Valette painted a smog-filled Manchester during the industrial era. I drew this piece in 2012, and tried to recreate the scene as it is experienced in the present day. I found the exact spot where Valette would have stood when he painted the place in 1910, and made compositional sketches for my finished drawing. The cellar man pushing a hand cart has been replaced by a contemporary road sweeper, and in the background a modern day taxi takes the place of hansom cab. In Valette’s painting you can just make out the surrounding buildings through the smog. The modern skyline had changed, but the Albert Memorial and statue of Gladstone remain the same. ‘Holding on’ (75 x 90cm) Charcoal, acrylic and oil on canvas. 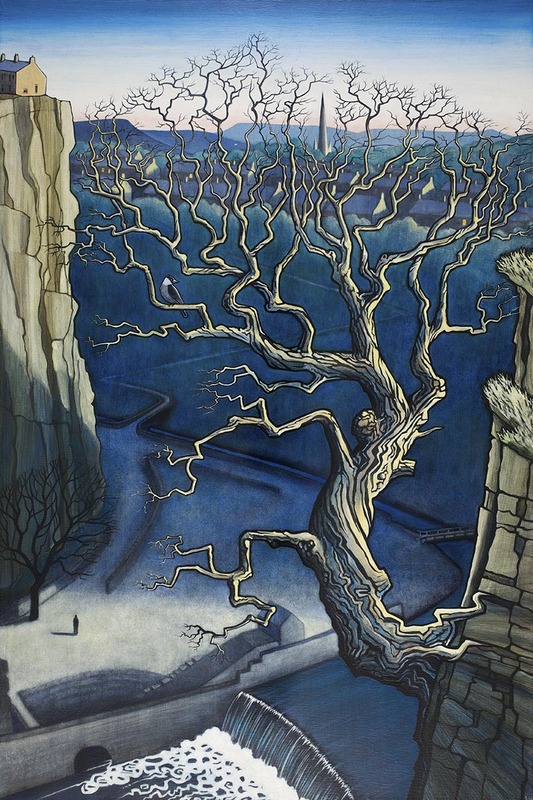 This painting is loosely based on The Torrs, a deep gorge that runs through the town of New Mills, Derbyshire. An old oak tree grows out of a rocky outcrop, holding on impossibly to the steep sides of the cliff. A jackdaw perches on a branch, and in the distance the spire of St. George’s church can be seen. There is a warm glow in the early morning sky, and a single figure can be seen in the bottom of the gorge. This is a personal painting about the determination and strength of the human spirit. I made this painting in response to the lead up and aftermath of the EU Referendum of 2016. It features a lamp post on Market Street, New Mills, Derbyshire which is covered with stickers expressing views from opposing sides. Emotions ran high around this time, and I wanted to express the uncomfortable feelings of division which the vote brought out in a small community. One side of the street is in heavy shadow, the other is brightly lit. 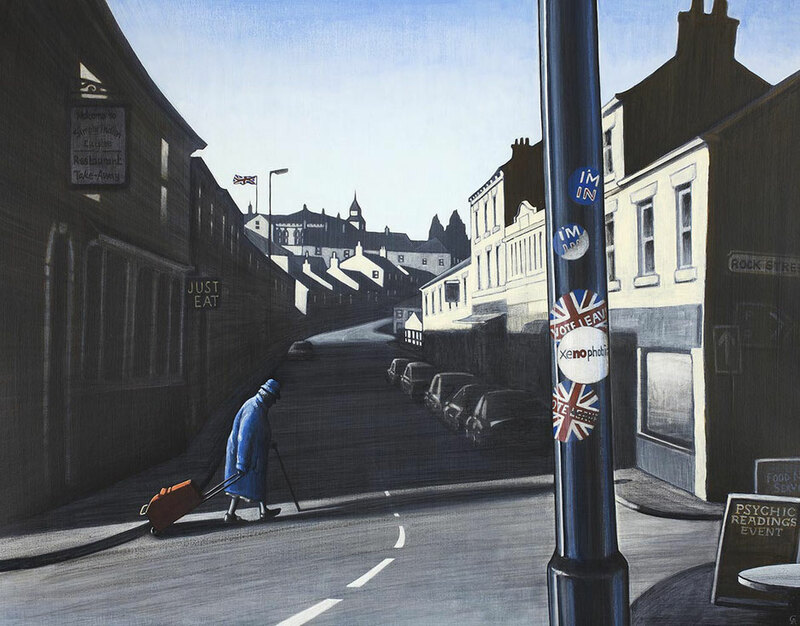 An old lady crosses the road, several Fast Food Shop signs can be seen, and the Union Jack flies from The Town Hall in the distance. Please contact me directly if you wish to purchase an original piece of work.